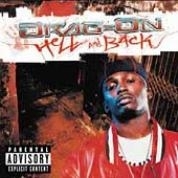 RapReviews.com Feature for February 17, 2004 - Drag-On's "Hell and Back"
It's somewhat surprising to see that Drag-On is still making albums. It's been four years since the "Opposite of H20" album was released, and while it might have pleased what (if any) Drag-On fans were out there it didn't make big waves artistically or commercially. He seemed poised to be the next star out of the Ruff Ryders camp following the success of DMX and Eve, but the hit singles like "Down Bottom" were ultimately misleading. Some rappers go solo from their crew and soar to great heights; ironically, the "Dragon" of DMX's posse crashed and burned. Drag keep 'em bouncin, Swizz keep 'em singin"
Then beat it up like I produced the track, what? I run through cash, CASH run through you"
Drag-On does get his album back briefly on "Put Your Drinks Down," thanks to the salsafied production style rapidly becoming status quo in hip-hop and some heavy bass courtesy of Needlz. Drag-On needs Needlz and guys like him, because he hardly creates fire on his own. His similies about how chicks are like basketball when they "lay up" are HA HA funny, and far from witty. His flow is reminiscent of LL Cool J's near career derailment from the "Phenomenon" song, when he suddenly decided talking quietly and without emphasis made for a good flow. To date, Busta Rhymes is the only one to pull off this style, because even when barely breathing on a mic he still sounds like a hot kettle on the stove waiting to explode. Drag's more like an icicle left on an electric hot plate, slowly warming up and eventually evaporating into nothingness. But if I catch her feelin me, would you bell at your boy? But don't hate on your boy Drag, Drag got love for you"
One would prefer not to hate on Drag, but it's tantalizing hints of dopeness like these that make the mediocrity of the rest of his album so insufferable. Sentimental songs like "My First Child" prove he's a sensitive thug, but that too is a cliche any more in East coast rap and others have done it better. "It's a Party" is more clever, as it opens with a spoof of club music and turns into a bloody beat, but his faux Jamaican accent needs work. By the time you reach "Life is Short" you'll be wishing the same of this nearly sixty minute album. In the end it's true that some things NEVER change, chief among them that despite having four years to improve his rap, this potentially hot MC makes music that lives up to his name - it drags on.